Steve, apparently this was a hoax. Here's a clip from a newspaper from 1957. There are other sources that indicate that the Sister Juliette story was a hoax. Damn. It sounded good. I've heard of pistol-packing-mamas, but rifle-toting-sisters? "Vengeance is mine", sayeth the Lord, "and these are my instruments!" I truly hope it's NOT a hoax!....L.B. 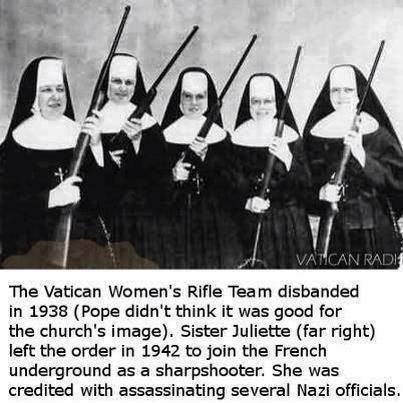 Traditionally, nuns are not armed with rifles. Yeah, that's TRUE, R. A. W.(great initials, by the by!) --and your chances of surviving an enraged nun with nunchucks is slim to nun......L. B.